Weather Hotter than very hot. 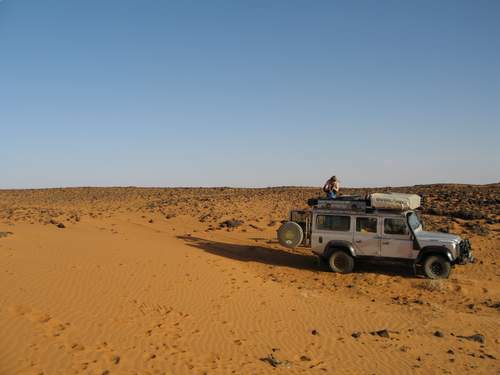 Diary Desert Camping Had our first medical emergency whilst camping in the desert en-route to Dongola. Nye suddenly screamed with terror “IT BIT ME….THE SPIDER BIT ME!!! IT HAD HUGE PURPLE EYES!! IT BIT ME!! Nye and all three girls immediately dissolve into hysterics and floods of tears….”Nye’s going to die dad! !” etc, etc “Lets have a look then” What I think has actually happened is a large beetle was as surprised as Nye to end up in his hair ….Nye had brushed it off just as the beetle decided to taste this juicy rarebit for itself….result, one frightened child with a tiny bite and one terrified beetle. Did my bit for desert ecology by stamping on beetle which promptly burrowed into the sand and then administered “the magic sponge” (It really works) to Nye. Trying to get the kids to realize that there are dangerous animals outside the tents at night is a constant battle. DON’T FORGET TO WEAR YOUR SHOES!! Is my constant refrain. Took them for a walk the next morning and spotted snake tracks, scorpion prints and dragon droppings…they will be more careful after this, at least for 2 or 3 days. Can now get all tents down, kids washed, dressed, breakfasted, and packed up ready for the road in about an hour and a half depending on how strict we are with teeth inspection, anyone who has a “camel mouth” has to brush again. Pic shows "typical" camping spot.